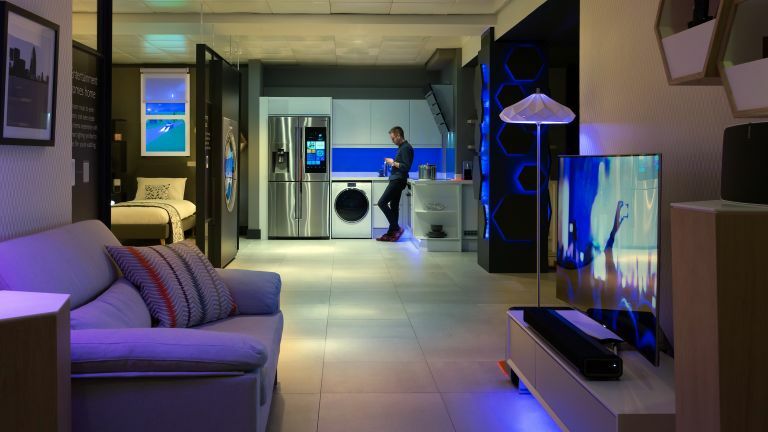 You can sense that punters in the UK are teetering on the brink of buying into the smart home idea. Now John Lewis wants to give them a shove in to the connected abyss, with a dedicated section in its flasghip London store. Leading the charge is Samsung's entirely over-specced Family Hub, which is a massive fridge with a huge Android tablet embedded in it, web connectivity, and cameras for keeping your lettuce under surveillance. Yes, really. According to Mobile Industry Review, 14 per cent of UK households already boast at least one smart device. John Lewis reckons sales of smart home products have gone up 81 per cent in the last year, although presumably that's from a rather low base. However, we all know that the tech's not quite there yet. Not everything inter-operates slickly, and there are too many variables that leave consumers thinking, 'I'll give it another year." Well, John Lewis isn't going to stand for that. It wants your money now, and it's not going to hang around while you make your mind up about a purchase. You big baby. So it's bringing a 1,000 square foot space to its flagship, Oxford Street store, essentially recreating my flat, but with helpful shop assistants, armed with tablets, who can demonstrate every single bit of tech on show. A brisk trot around the space this morning revealed a lot of familiar tech - Nest's suite of products in the hallway, Sonos in the lounge, Dyson's new air purifier in the bedroom, the Bluetooth Nespresso machine on the kitchenette's tasteful worktop - but also the aforementioned Family Hub. The huge screen lets you use just about any Android apps, but the ones specifically optimised for fridge use are, as you'd imagine, the most interesting. You can have it read out the weather and news headlines when it detects your first approach in the morning, leave memos for yourself or other family members, mirror connected TVs on your home network - not just Samsung ones, rather impressively - listen to the radio, and more. What it doesn't try to do is any kind of automatic shopping - detecting when it's time to buy more milk and ordering it for you. However, it does have a less potentially irritating set of features based on a pair of internal cameras and a mobile app. First up, the cameras give you a live, cloud-based view of what's in the fridge from anywhere you may roam. That means you can check if you've run out of organic milk while you're in Waitrose. You can also pull down little stickers on the camera view, tagging meat and other perishable produce with the number of days until its use by date. The app will count down to the fateful day, and even offer recipe tips for food that needs to be got rid of in a hurry. Now admittedly, the Family Hub costs £4,500 but you do get an awful lot of fridge for your money, on top of all the smart features. We love it, but would we buy it? Erm… No. But you go right ahead. Along similar lines, an AEG smart oven is on sale that lets you monitor your cakes or souffles or whatever via, yes, another internal camera. CCTV really is everywhere these days. You can raise and lower temperatures as required, or turn the oven off, all from the comfort of your bath or sofa. Johnathan Marsh, John Lewis' buying director for electricals and smart home told T3 he sees this as phase one. Possible developments in the future could include installation and after-sales maintenance, and more integration of services, so that, "When you wake, your sleep sensor tells your air purifier to turn on, starts brewing up your coffee and so on." For now, however, it's more about showing customers how the entire range of products from numerous different manufacturers can all be controlled from one tablet, although not, so far, from one app. This is a brave move from John Lewis, because anyone who uses a lot of smart home tech will know that it's by no means 100% reliable. But although the demos we saw inevitably included moments where connectivity failed, in the cases when it did, the John Lewis partner was able to get it working again in short order. I predict these hardy sales-folk will be doing a LOT of turning the Wi-Fi off an back on again, and salute their courage, in advance. The smart home experience is on the 5th floor of the Oxford StreetJohn Lewisand, obviously, it's open to the public. The plan is then to roll it out to otherJohn Lewis branchesacross the UK, starting with the new Leeds store in autumn.